Ontraport’s solutions work together to give you everything you need to run your business in one centralized, easy-to-use platform. Give each customer a tailored experience to drive sales while eliminating busy work for your team. Send emails that keep your customers engaged so your sales continue to grow with your list. Land more leads and customers with web pages that promote your products and show off your brand. Use visual analytics to make confident decisions for smarter marketing and more profits. Create a custom subscription site and manage it from one place to earn recurring revenue with ease. Optimize your entire sales process to generate more prospects, nurture your leads, and close more sales. Online sales to seamlessly manage payments and subscriptions. Personalize every customer interaction to generate more sales using all-inclusive customer data. Automate your team’s most time-consuming, repetitive tasks to create more freedom in your business. Drive and track revenue generated by referral partners who receive commissions for helping you grow. Find free content on the latest marketing strategies, using Ontraport in your business, and finding the right software solutions. Browse a collection of articles on marketing automation, email marketing, CRM, membership sites and more. Download our best-practice guides, complete with data-driven insights and tactics to help you optimize your marketing. Listen in as Ontraport CEO Landon Ray talks with with a star-studded cast of entrepreneurs, marketers and thought leaders. Learn everything you need to know to develop fundamental marketing strategies with our digital handbooks. See if Ontraport is the right fit for you — compare the top marketing automation and CRM software on the market. See exactly what you can do with Ontraport, and learn how you can personalize it to perform your specific needs. View the most frequently asked questions about Ontraport so you can get clarity and feel confident in your buying decision. Take a guided tour through the five phases of the customer lifecycle in a simulated business powered by Ontraport. Get an honest estimate of the return you can expect from an investment in Ontraport's software. Ontraport empowers businesses large and small, all over the globe, and in every industry, to succeed. Don’t just take our word for it. See why businesses from every industry love Ontraport’s marketing automation and CRM software. Find out how our users have created thriving businesses and transformed their lives with Ontraport. Note: The Form Connector has been deprecated and does not appear in any account established after October 17, 2018. Due to increasing security concerns and "bot blocking" the Form Connector no longer works in most cases. Applies to: All ONTRAPORT accounts, and ONTRApages Premium accounts established before October 18, 2018. The Form Connector allows you to have an ONTRApage form populate another form on the web. This can be used to simultaneously add contacts to another system when they fill out your ONTRApages forms. Note: Due to increasing security concerns many programs block the Form Connector. We recommend you use the Zapier Integration for these programs. Your contacts will never see the form in the other program so be sure to include any required notices on your ONTRApage. Your new contact will be redirected to the Thank You page specified in ONTRApages and not to the Thank You page on the other system's form. Other actions taken by the form filled out in the background by ONTRApages should work as before. Test to verify that your newly connected form works correctly. 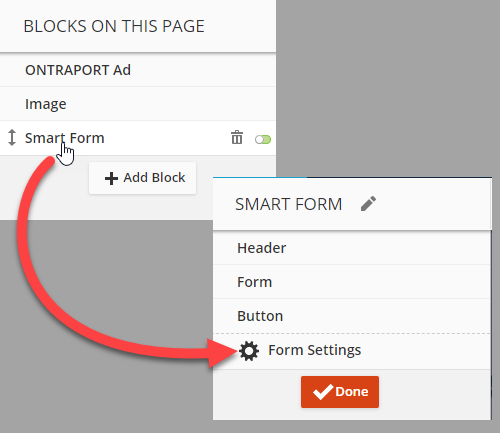 Create and save your ONTRApages page with a Smart Form block first. Add fields to the ONTRApages form so it will match the form you wish to connect to in the background. Make the fields on your ONTRApages form the same type, and also "required" if the matching field on your other form is "required". You must have at least the required fields on your other form represented on your ONTRApages form. Click the Smart Form block to edit it, and then click the Form Settings gear icon. The Form Settings dialog will pop up. The middle section will be titled Form Connectors . Click the Add New button. In the Form Connector pop up, enter the URL where your other form is hosted on the web. Then, click the Get Form button. ONTRApages will go to that URL, and search for the form. If found, ONTRApages will list the fields in ONTRApages ("This Form") and the matching fields in the other form ("That Form"). Select the down arrow next to the field listed under "This Form" to match it to the other form. Select Ignore Field from the drop down to not modify the field on the other form. When finished matching fields, click the Test Connection button. ONTRApages will determine if it can fill in the form and submit it in the background. If the test is successful, click the Save button. If the test is not successful, double check to make sure you have required fields on your ONTRApages form that match up to the required fields on your other form, and retest. Publish and then test the ONTRApages form. Check to see that the other form submits the data correctly to the other system. The contact is added to your ONTRApages account. ONTRApages submits the other form in the background. The other form may add the contact to your mailing list database or take other actions. All of the functions normally present if the contact had filled out that form should work in the same manner, except for the redirect to the "Thank You" page. The ONTRApages thank you page redirect will take precedence. Be sure to include all the required notices for your other form on the ONTRApages page to avoid violating the terms of service for that company. Include any legal disclaimers for that opt-in form on your ONTRApages page. For these programs the Zapier integration is an automated way to add Contacts to those programs as they are collected by your ONTRApage or ONTRAform. Campaign Monitor masks the appearance of their self-hosted forms. 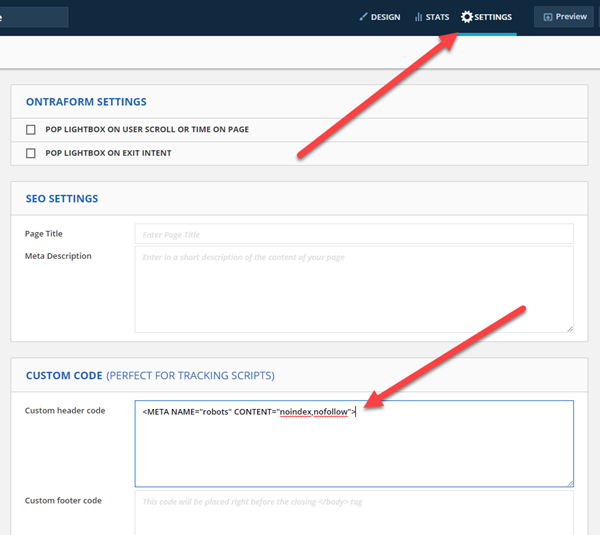 Use the option named Copy/paste a form to your site instead of the direct link to a subscription form. Host the code on a webpage, and use that URL in the Form Connector. Create a NEW ONTRApage, starting from scratch with NO forms on it. Add any non-form block to the page to enable saving the page. Remember, this page will only be used to provide the Campaign Monitor form to your ONTRApages, so don't worry about design options, etc. After adding a non-form block, save the page. 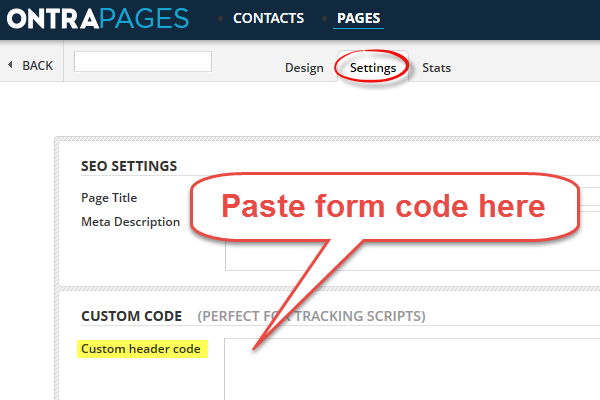 Paste the Campaign Monitor form code into the Custom header code section. Publish that page on one of the ONTRApages domains using any URL you desire, such as "http://cmform.ontrapages.com"
Use the URL you just created in your ONTRApages Form Connector! Create your forms or use the provided forms in Constant Contact. Click on the Actions menu on the web sign up form, then select Form URL. MailChimp uses a pop-up Captcha on the default opt in form as per this article. This is to prevent automated "bot" submissions, but also results in submissions from the ONTRApages Form Connector being blocked. However, you can embed a custom opt in form in a page on your website or even on another ONTRApage and connect to it. MailChimp also has three hidden fields that are pre-populated with data to thwart bots; choose Ignore Field when matching these on the Form Connector. In MailChimp, select your Mailing List to use for your opt ins. When the page for the mailing list opens, select "Signup forms" and then "Embedded forms". On the next page, you want to have the form show only the fields you will match up to your opt in form on your ONTRApage. At a minimum, you will want the Email Address and make it "Required". You may also want first name, last name, address, etc. You specify these fields in the Form Builder link on that page (under the "Show only required fields" radio button. When you have the fields specified correctly, copy the form code for use later in ONTRApages. You can paste that code on your own website, or even on another ONTRApage using the Custom HTML block. The following steps show how to use another ONTRApage and keep this "secret ONTRApage" from being indexed by search engines. To host the MailChimp embed form on an ONTRApage, create a new ONTRApage using the "Start from Scratch" template. Add a Custom HTML block to the template. Click to edit the Custom HTML block. Click the "Edit Code" button. Delete all of the sample code in the Custom HTML block. 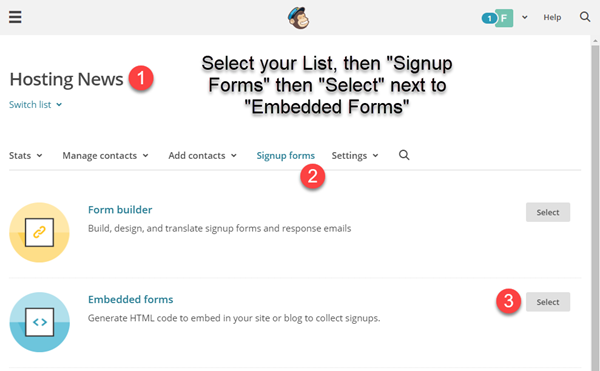 Paste the MailChimp Embedded form code into the Custom HTML block. Save the block on the left, then click the Save button at the top right of the ONTRApage. 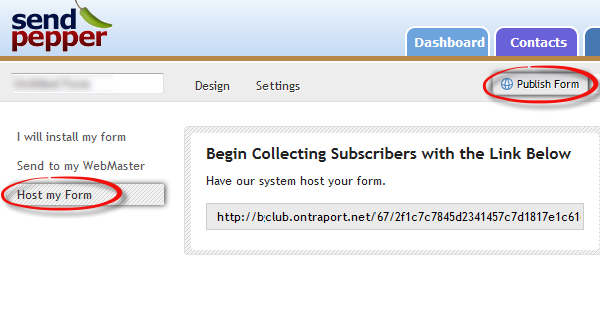 Click "Publish" and host the ONTRApage on any domain. Remember this page won't be seen by anyone else; it is only being used by the Form Connector to automatically add any of your ONTRApage opt ins to MailChimp. Copy the published URL for use later in the Form Connector on your opt in ONTRApage. Save and exit the ONTRApage. After hosting the MailChimp Embedded form code on your website or on another "secret" ONTRApage, go back and open your opt in ONTRApage for editing. Click on the Smart Form in the palette on the left to open it for editing. Click the Form Settings icon at the bottom. Click to Add a new Form Connector. Add the URL where you hosted the MailChimp embedded form code. 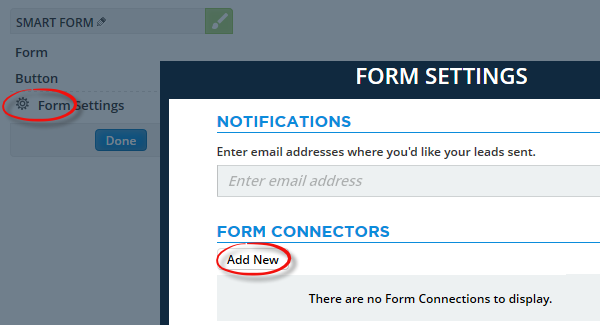 The Form Connector will connect to the form and retrieve the fields on the form. Match up the fields. 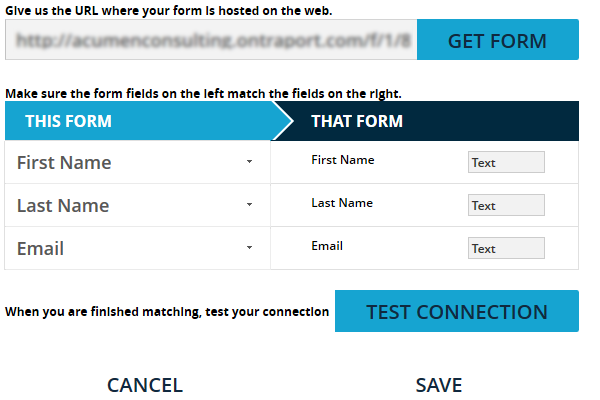 If you see a field you don't recognize on "That Form" (the MailChimp embed form you are connecting to) set the match "Ignore Field"
After clicking the Test Connection button, save the ONTRApage and test it using a test contact on the published page. You should see the contact added both to the ONTRApages Contacts section and also in your MailChimp email List section. For ONTRApages Premium accounts, remember that you can also export your contacts and import them into MailChimp, or consider using the Zapier Integration. Create your Smart Form in Sendpepper. Click the Publish Form button, then click on Host my Form. Host the form as you normally would on a web page. Provide the URL for that web page in the ONTRApages Form Connector. The actions specified by that form will still take place, except for any redirect after submission actions. The ONTRApages form takes precedence for redirecting the contact after they submit the form. Turn your business on with Ontraport.